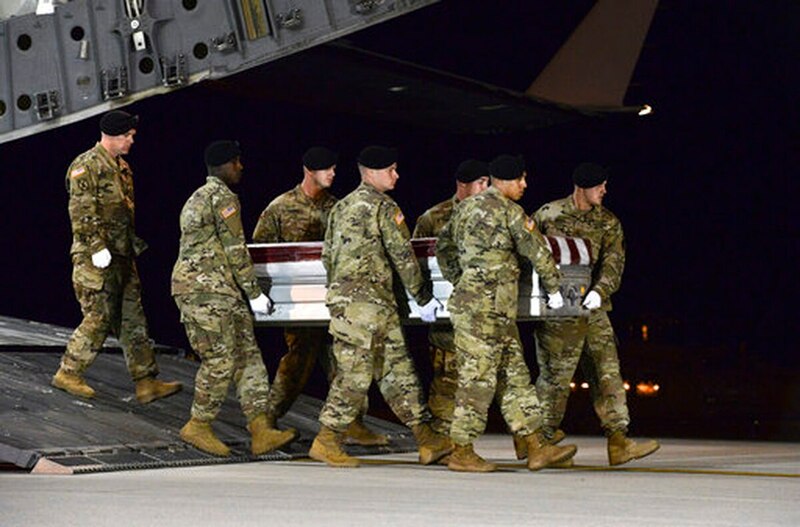 Senators briefed on the deadly ambush in Niger earlier this month said officials still don’t know how a U.S. soldier was separated from his unit and remained missing for almost two days. Sgt. La David Johnson was part of a 12-person U.S. Special Forces team working with 30 Nigerien partnered forces that was ambushed on Oct. 4. Three soldiers were killed in the ensuing firefight, and Johnson was separated from the rest of his team. His body was recovered almost 48 hours later by local military forces. Senators received their first formal briefing on the attack on Thursday after complaints from lawmakers that the Pentagon had not been forthcoming with details of the firefight or the broader mission there. After the briefing, Senate Armed Services Committee Chairman John McCain, R-Ariz., said his concerns about communication between the Pentagon and Congress have been allayed, but numerous questions remain about what went wrong on the mission. Earlier in the day, Pentagon officials announced that the investigation into the ambush would be lead by Maj. Gen. Roger Cloutier Jr., headquarters chief of staff for U.S. Africa Command. Senators said that work is expected to take about 30 days. Meanwhile, the deaths of the four American service members in a region outside better-known combat zones has raised questions among lawmakers about both U.S. presence there and whether troops conducting dangerous missions in Africa have adequate resources to respond to threats. “The American people need to be able to understand why we have 6,000 troops in Africa,” said Sen. Richard Blumenthal, D-Conn.
During a Pentagon press conference on Monday, Joint Chiefs of Staff Chairman Gen. Joseph Dunford said U.S forces were operating in an area not thought to be dangerous when they were attacked by an ISIS splinter group. Questions remain about the availability of intelligence before the attack and air support during the fighting. Senators said one clear message they took away from Thursday’s briefing was that the threat to U.S. troops and the U.S. homeland coming from Africa is unlikely to diminish soon. “I have no doubt there will be a need for continued U.S. military presence in Africa because of the proliferation of radical Islamic terrorists with the stated intention of murdering Americans,” Cruz said. But military officials did not request an increase in troop levels or funding for the Africa missions during Thursday’s briefing, and multiple lawmakers said public hearings on the goals there would be needed before any such decisions are made. McCain said he would make a decision on public hearings after the military investigation is complete. “We can betray sensitive information that can put the men and women serving there in danger,” he said. The Senate Foreign Relations Committee has scheduled a hearing for Oct. 30 on the issue of current military force operations used in the fight against terrorist groups, an issue that lawmakers said will need to be revisited if hostile operations in Africa increase. Both Defense Secretary Jim Mattis and Secretary of State Rex Tillerson are scheduled to testify at the event on Oct. 30. Pentagon officials have indicated in the past that they would be open to updating the current authorizations — passed in the wake of the September 11, 2001, attacks — to provide clearer military goals and powers. But President Donald Trump has not supported any initiatives offered by Congress in recent months, and lawmakers failed to compromise on a guidelines for new war powers even when former President Barack Obama repeatedly pleaded with them to update those authorities.